In the fall of 2016 and the first half of 2017, WMATA applied these guidelines to reject a series of ACLU ads displaying the text of the First Amendment in English, Spanish, and Arabic; an ad from the women’s health care collective Carafem for medical abortion pills; and several ads from the advocacy group People for the Ethical Treatment of Animals (PETA) telling people to “Go Vegan.” In June 2017, WMATA accepted and displayed ads for a new book by right-wing provocateur Milo Yiannopoulos, but then removed the ads after riders complained. During the same period of time that WMATA was rejecting or removing these ads, the transit agency was accepting and running ads promoting other controversial and health-related messages and advertising other consumable media on controversial subjects – including ads promoting eating animal-based foods, wearing clothing made from animals, and attending circus performances at which animals are made to perform in unnatural ways; ads for a play about right-wing Supreme Court justice Antonin Scalia and ads for a new movie with sexual content; and ads from a local hospital and ads from a health insurance company. In August 2017, the ACLU-DC and the National ACLU filed suit in federal district court in Washington on behalf of the ACLU, Carafem, Mr. Yiannopoulos’ company Milo Worldwide, and PETA. The suit challenges both the application of WMATA’s guidelines to this ideological diverse group of speakers and the constitutionality of the guidelines themselves, which are unconstitutionally viewpoint-discriminatory. We also sought a preliminary injunction on behalf of Milo Worldwide seeking to have its ads restored to WMATA ad space. We filed this suit to ensure that the influential ad space on Metro isn’t reserved only for majority viewpoints and messages associated with a commercial interest, and to ensure that riders have the opportunity to learn about services, products, and even laws that may be important to them – like medical options concerning reproductive choices, controversial books, and the First Amendment itself. In March 2018, the court denied a preliminary injunction to post the Milo Worldwide ad because the court thought the ad itself was controversial. 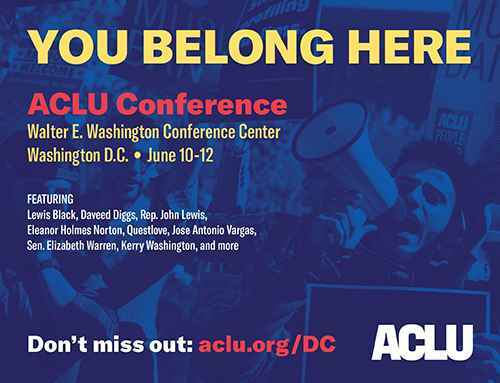 In May 2018, the ACLU tried to advertise its upcoming membership conference on Metro, and Metro refused to display that ad (pictured above) too, on the ground that even an ad about an event rather than a political message could be banned if the event advertised will discuss controversial views. We sought a temporary restraining order requiring Metro to post our conference ads, because Metro has been inconsistent in applying its Guidelines: sometimes it only looks at the face of an ad, but sometimes (as for our ad) it looks to outside information to find a controversial message. In late May 2018, the Court denied our motion. Although our preliminary motions were denied, we are continuing to litigate the ultimate issues of whether Metro's policy is arbitrarily applied or unconstitutional. For a detailed discussion of why the government shouldn’t be able to ban the text of the First Amendment, see here. For an explanation of why it’s worth representing speakers whose messages we condemn, see here.